Now there is always a story here. 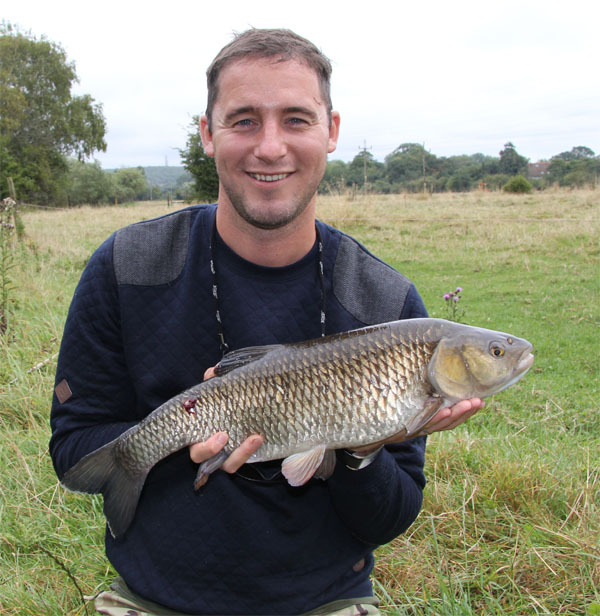 Chris booked a chub session with me in February on the river Stour. We fished all day and had a big fat blank! The river was at the right level however for some strange reason there was a funny colour to it. We tried really hard to find a chub or two but failed. I always feel really down at blanks however that’s what happens at times. However I just couldn’t work it out. Anyhow he contacted me again to turn things around and show him how to catch a chub or barbel on my bait and wait routine. The day in question was to be fine in the morning but pour with rain during the afternoon. We started walking the river spotting plenty of chub but no barbel until we reached a pool where there was one in mid stream. We threw a few West Country elips pellets into the swim but away from the barbel and sure enough it came over and started feeding. Then another fish about double the size of the original came feeding too. A few more pellets went out and soon the dreaded chub came on the prowl. The barbel looked to be about 9lbs. The barbel were coming in and out of the baited area like they normally do. Very quickly we tackled up using 8lb line as there were few snags around and size 14 hook with a braid hooklink bedded down with 2 tungsten sinkers spread out. A very quick check on the clutch setting showed all was very good and we could apply maximium pressure on the fish before the line broke. The pellet on the size 14 hook was the large (10mm) West Country elips pellet. First of all I back leaded, however this didn’t feel right after the barbel passed over the hook bait a few times. So I changed to a 1oz free running lead and recast. Whilst I did all of this Chris made a brew for himself. Back he came and the barbel were still feeding. Irish George an old friend, well not old but a great friend came along and moved to a swim just above us. Now George knows where the barbel are on this beat and at least we were in the right area for sure. In a flash I saw the larger fish jerk away and it looked like it was hooked. Correct the rod sprang into life and Chris was on it like a flash. The fight from the 9lber was incredible, I was coaching Chris to be one step ahead of the barbel not letting it get too close to some reeds, then coaxing it away from some willow branches. I was saying lets keep one step ahead and keep the fish in mid river where we can play it out ready for netting. Chris did an excellent job, well I would say that wouldn’t I. 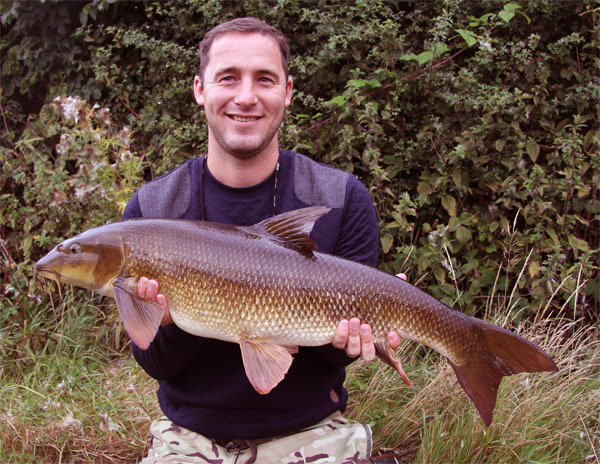 The 9lb barbel soon came over the net and looked a double for sure. On lifting it up it was bigger. So we unhooked the fish and while Chris rested it in the river, I prepared the weighing equipment plus camera etc to reduce the time that the fish was out of the water. Up she came on the scales she went 14lbs 4oz and 6oz off for the sling gave a weight of 13lbs 14oz, not bad for your first ever barbel. Quickly a few photo’s were taken. As I rested the fish in the river the bailiff came along and asked Chris for his day ticket. Chris stood there with a glazed look on his face whilst fishing around for his ticket. My book was looked at also. The barbel headed off after a short time resting looking every bit a double. So what a first barbel. So we then went in search of a few chub and walked most of the beat past the school bridge. Again we saw plenty of chub however no barbel but by now it was pouring with rain. We stopped off where we saw some good chub and here I baited with hemp and pellet and soon 4 chub were feeding. There was one over 6lbs and a couple of about 5lbs one with a white spot on it’s nose. We fished right under a tree where we had one bite however it was only a pluck. After 30 mins the chub were feeding hard on the hemp and pellets. They were cruising in and out of the swim picking up the odd pellet. So when they left the rig was lowered into the swim. It didn’t take long before one of the chub came along and took the pellet. Again spotting the fish take the bait was exciting to say the least. Chris was on the rod as fast as a coiled spring and playing a good chub. It wasn’t the bigger one however at 5lbs 4oz not disappointing. It was still poring as we made our way to another swim, however another angler had moved into it. So we moved to another. Again out went some hemp and pellets and it wasn’t long before 12 chub or so could be seen hovering up the feed. My god it was raining heavily now. After a sandwich and drink we cast out. Of course the chub scattered but soon came back to feed on the dinner table we had laid. Well 3 small chub came and picked up the baits for the couple of hrs we were there and still it rained. We tried one more swim with only a few small chub showing we decided to call it a day. Feeling very wet. Got to say Chis was still buzzing. One thing I said to Chris as he like to do lots of different fishing is to set some targets and goals for the next 12 months. This should help him focus on what he wants to do. However the most important thing is to enjoy your fishing. I think he did today! Happy days. This entry was posted on Thursday, August 20th, 2015 at 9:49 pm	and is filed under Uncategorized. You can follow any responses to this entry through the RSS 2.0 feed. Both comments and pings are currently closed.